Heat oven to 375°F. Spray large cookie sheet with nonstick cooking spray or lightly grease. Separate dough into 5 biscuits; place on sprayed cookie sheet. Press out each biscuit to form 6-inch round. Spread each with mustard-mayonnaise sauce. 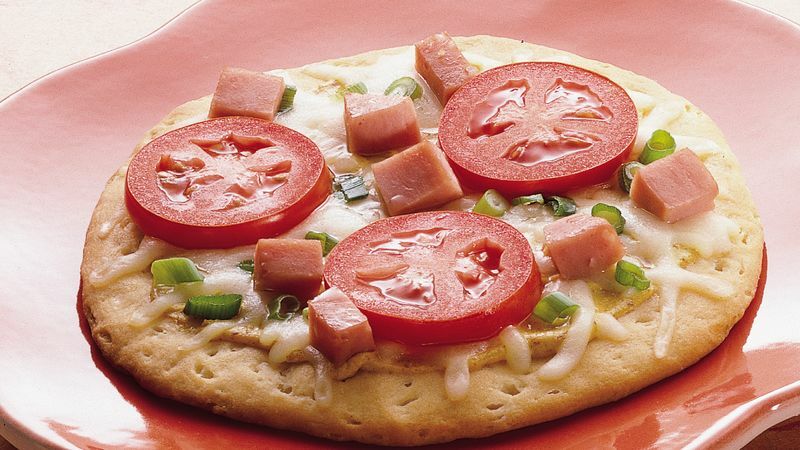 Top each with cheese, ham and onions. Cut each tomato into 5 slices. Place 3 tomato slices on each pizza. Bake at 375°F. for 10 to 15 minutes or until bottoms of crusts are deep golden brown and cheese is melted.